Commercial air conditioning installation is typically far more complex than home installation due to more complex layouts and the need for more equipment. We will follow and comply with your specifications and plans for new construction, air conditioning system replacements, upgrading of existing systems and modifications for commercial remodeling and expansions. And, we will make sure that all necessary permits are in place. We excel at providing commercial air conditioning design, installation, efficiency and performance. Our experience makes us the right choice for all of your commercial air conditioning needs. Assistance in filing for and obtaining any necessary permits. Upgrading can result in savings of up to 40% of your current energy costs. Switching to a modern system that's highly efficient might also qualify for valuable energy rebates and tax breaks. Our technicians maintain Charlotte commercial ac systems to keep them running at peak efficiency. Preventive maintenance is the key to sustaining optimum air quality, conserving energy, staying in the comfort zone and prolonging life of your newly installed equipment. At Always Heat and Air, we offer variety of maintenance packages to meet the needs of your company. Please don't hesitate to contact us and one of friendly associates will be happy to assist you. Give us a call now to discuss your commercial air conditioning installation needs. 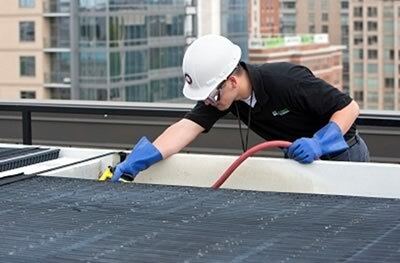 Expert, reliable commercial air conditioner repair in Charlotte will keep your workers and clients in the comfort zone. We're available to handle everything from slightly inefficient cooling to complete meltldowns. Our EPA certified professionals provide a complete diagnostic check-up of your ac system. We are highly experienced at accurately determining what needs to be done. There could be a refrigerant leak, a clogged or sluggish drain line, a faulty thermostat or disconnected ductwork. Or, your commercial ac unit motor, compressor or contactor might have to be replaced. Whatever your commercial air conditioner repair needs are, our courteous, uniformed technicians will go over your repair options in detail. Repairs can often be made at the time of the initial service call because our trucks are always well stocked with parts. The best way to prevent a meltdown is to call for repairs at the first indication that there's an issue with your commercial air conditioning system. Some signs are extremely obvious and should prompt you to call us immediately. Loud rumbling or banging noises are great for scary movies but they should not be coming from your commercial ac unit... Not ever. It's also not normal to experience warm spots within any air-conditioned areas of your facility. Unexplained higher energy consumption without any increased demand for cooling. If your energy costs are going up each month and there's no clear reason for it, your cooling system is probably the culprit. Slight variations in room temperatures can signal trouble with the ac distribution. It can be difficult to notice small changes from one room to another or within different parts of the same room. Pay attention to the readings on the room thermostats for an early clue that your unit isn't running at peak efficiency. When your commercial ac unit is in need of repair, it isn't going to fix itself. Ignoring any signs of inefficient ac operation won't make the problem go away. The symptoms will get worse over time.. Putting off calling for professional help usually results in more extensive or complicated repairs; that means higher repair costs. Our technicians maintain Los Angeles commercial ac systems to keep them running at peak efficiency. Preventive maintenance is the key to sustaining optimum air quality, conserving energy and staying in the comfort zone. At Always Heat and Air, no commercial ac job is too small and no call for help ever comes too early. Right now is the perfect time to contact us with your need for commercial air conditioner repair in Charlotte.